Chef Daniel Humm and restaurateur Will Guidara – the creative minds behind “World’s 50 Best Restaurants 2017” winner Eleven Madison Park in New York – recently debuted their signature concept, NoMad Restaurant, at NoMad Las Vegas. The highly anticipated eatery is the newest offering at the just-opened hotel within Park MGM, a collaboration between Sydell Group and MGM Resorts International. With a design meticulously overseen by French architect Jacques Garcia and inspired by the renowned Royal Portuguese Cabinet of Reading in Rio de Janeiro and the iconic Library of NoMad New York, this new NoMad Restaurant features soaring 23-foot ceilings and a menu that celebrates American classics in a grand and continental way by striking a distinct balance between accessibility, theatricality and luxury. For more information, contact Renata Follmann, Rossetti Public Relations, NoMadLV@rossettipr.com. Wynn Las Vegas recently announced the addition of three iconic brands to the resort’s collection of world-class dining and wellness offerings. Debuting in Las Vegas for the first time Cipriani, Urth Caffé, and SoulCycle are dynamic new standouts in the city’s vibrant lifestyle scene, and exemplify the one-of-a-kind guest experiences that can only be found at Wynn. Cipriani, the internationally celebrated four-generation hospitality brand, continues its global growth with Cipriani Las Vegas, their first restaurant on the West Coast. Urth Caffé exclusively offers organic heirloom coffees, with the new location being the first U.S. expansion outside of California for the Los Angeles-based brand. Just steps away is SoulCycle, the indoor cycling phenomenon ideal for visitors focused on fitness, or for locals looking for a new type of group workout experience. For more information, contact Eric Kreller, Wynn Las Vegas, Eric.Kreller@wynnlasvegas.com. Lisa Vanderpump and Caesars Palace will partner to open Vanderpump Cocktail Garden, set to debut early 2019. Bringing a taste of Los Angeles to Las Vegas, the cocktail garden will take a page from Vanderpump’s highly successful restaurants and lounges, Villa Blanca, SUR, Pump and Tom Tom. Marrying natural elements with industrial touches, Vanderpump Cocktail Garden will have an indoor patio welcoming guests upon arrival, transporting them to an al fresco-style garden with towering trees and romantic lighting. Inside, the romantic elements continue, including Lisa’s signature touches of pink, with contrasting masculine details. The lounge area will feature booths as well as a full bar that focuses on craft cocktails, Vanderpump branded Sangria and Rosé as well as a carefully selected wine list. Small bites will be available to be shared or perfectly paired with libations. For more information, contact Chelsea Ryder, Caesars Entertainment, cryder@caesars.com. Epic Venues announces its latest project, Mansion54, to open early December 2018. Mansion54 is a collection of unique, elegant spaces that are flexible for special events, wedding receptions and endless possibilities. The venue features 25,000 square feet of space, an outdoor terrace, two pools and a client concierge team. Formerly the historic Hartland Mansion, Epic Venues bought the property in September 2018 and the property is currently under renovation. When it makes its debut in December of this year, Mansion54 will aim to be one of Las Vegas’ hottest venues for special events. 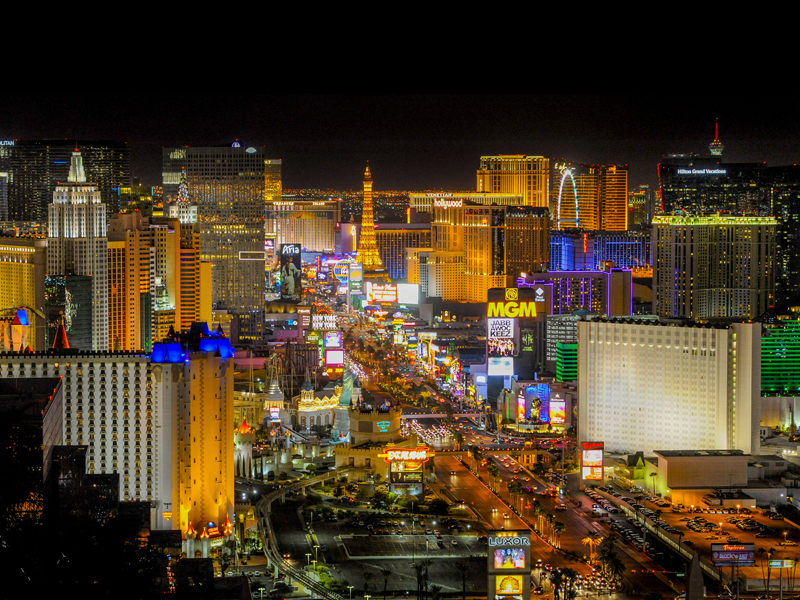 Additionally, Mansion54 will actively participate in the Downtown Las Vegas community. For more information, contact Nikki Neu, GLOBAL Public Relations, nikki@globalpublicrelations.com. Wynn Resorts announces the acquisition of Arrows and Flower Neon Sign, a contemporary multi-media sculpture from the visionary minds of Takashi Murakami and Virgil Abloh. At nine feet tall, the imposing kinetic neon masterwork blends the signature arrows from Abloh’s fashion label, Off-White, with Murakami’s iconic rainbow flower. Fashioned from neon, aluminum and stainless steel, the sculpture was originally included in Murakami and Abloh’s momentous collaborative exhibition entitled “AMERICA TOO” at Gagosian’s Los Angeles space. Less than two weeks after the exhibition’s close the sculpture was installed at Wynn Las Vegas, and is now on display in Wynn Plaza as part of the resort’s continued appreciation and commitment to public art. For more information, contact Eric Kreller, Wynn Las Vegas, Eric.Kreller@wynnlasvegas.com. Vdara Hotel & Spa, the stylish all-suite, non-smoking resort in the middle of the Las Vegas Strip, will add to its modern amenities with the debut of Vdara Club Lounge in January 2019. Located on the second floor next to the award-winning ESPA at Vdara, the Club Lounge is a secluded, well-appointed retreat where guests will have access to a pre-arrival concierge to contact guests prior to arrival to assist with booking restaurant reservations, show tickets or any other needs, and continue to assist guests throughout their Las Vegas visit; delectable bites including a rotating selection of gourmet options and a selection of grab-and-go items stocked throughout the day; social hour each afternoon from 2 – 4 p.m., featuring complimentary hors d’oeuvres and select beer and wine; and collaborative work spaces featuring a naturally lit, comfortable and quiet place for guests to work. Vdara Club Lounge will be an included feature for guests of Luxury Suites, City Corner Club Lounge Suites and Studio Fountain View Club Lounge Suites, and will be available to all Vdara guests for an additional fee. For more information, contact Robert Flicker, Kirvin Doak Communications, rflicker@kirvindoak.com. In celebration of her 75th birthday diamond jubilee, international music icon Diana Ross makes her return to Wynn Las Vegas in winter 2019 with her all-new show, “Diamond Diana.” Following three highly-successful engagements, Ross will present nine performances in her fourth headlining engagement at the Encore Theater. Ross will celebrate her enduring collection of award-winning songs, brilliant new costumes and timeless memories in this exclusive, self-named powerhouse production at Wynn. Performance dates will span from Feb. 6 – 23, 2019. For more information, contact Erica Benken, Wynn Las Vegas, erica.benken@wynnlasvegas.com. The Howard Hughes Corporation, owner of the Las Vegas 51s, the city’s professional baseball team and member of the Pacific Coast League (PCL), will announce the team’s new name and unveil its new logo on Dec. 8. The name change comes on the heels of the team’s September announcement of its new two-year Player Development Contract (PDC) with the Oakland A’s, and in advance of the spring 2019 completion of Las Vegas Ballpark. The new Triple-A baseball stadium will serve as the team’s new home with the season and stadium opener slated for April 9, 2019. For more information, contact Jim Gemma, Las Vegas 51s, jgemma@lv51.com.